Bristol City are closing in on the signing of striker Arnold Garita, a player that manager Steve Cotterill has described as a "£50,000 punt". Garita, 20, plays for Chateauroux in France's third tier and was at Ashton Gate on trial in November. "Arnie is a £50,000 punt that will play in our under-21s," Cotterill told BBC Radio Bristol. "We don't have anyone who is as physically strong as he is. He's raw, big, strong, tough and hungry." The Robins are currently short of options up front, with Jonathan Kodjia, signed from French side Angers last summer, starting all but one of their matches in the Championship this season. Cotterill says that Garita will train with City's first team, and could force his way into the senior XI as his search for new players continues. "In the first training session he clattered Nathan Baker, and then Nathan clattered him back, and he had a big smile on his face," said Cotterill, who had been hoping to extend Elliott Bennett's stay with the club before he joined Blackburn from Norwich on Tuesday. "He endeared himself to all the lads by working hard and we have to see where that one goes. If he ends up in the first team it'll be one hell of a story." 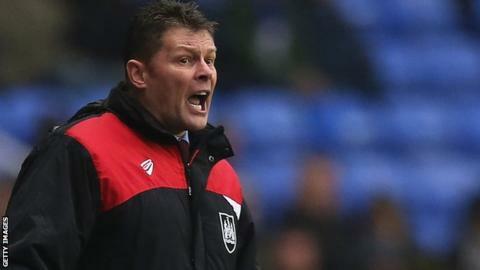 On the type of player he is hoping to sign in January, Cotterill added: "Good ones if we can - the trouble is there is a lack of good ones available. "We need some players that can go in and help the younger ones. "We are doing our best. My phone is having to be charged two or three times a day - we just want a few good ones. We don't want the wrong ones, we've got a lot going for us."